Elevate Energy helps people do more with less energy. We design and implement programs that reduce costs, protect people and the environment, and ensure the economic and social benefits of clean and efficient energy use reach those who need them most. Elevate Energy staff have different interests and areas of expertise, but we all come to work each day to deliver smarter energy use for all. We helped building owner Jim Saccone retrofit his 19-unit building in Chicago, creating healthier, cozier homes for his tenants and reducing his operating costs. In addition to air sealing and insulation work to keep units comfortable, we were able to connect Jim to over $22,000 in utility-funded incentives for the new boiler, lighting retrofit, and water efficiency fixtures. In the summer of 2017, we invited U.S. Representative Mike Quigley to tour Jim’s building to see how supporting clean energy programs can preserve healthy, affordable housing and create local jobs. Elevate Energy and the Detroit Local Initiatives Support Corporation implemented the Multifamily Green Initiative (MGI), which helps affordable multifamily property owners in underdeveloped areas of Detroit make efficiency investments in their buildings. We helped one MGI participant, Develop Detroit, identify energy efficiency, water efficiency, and solar installation options that could reduce energy use by 47 percent. We helped bring Ameren Illinois Power Smart Pricing and ComEd’s Hourly Pricing into the world, and we administer the programs today. 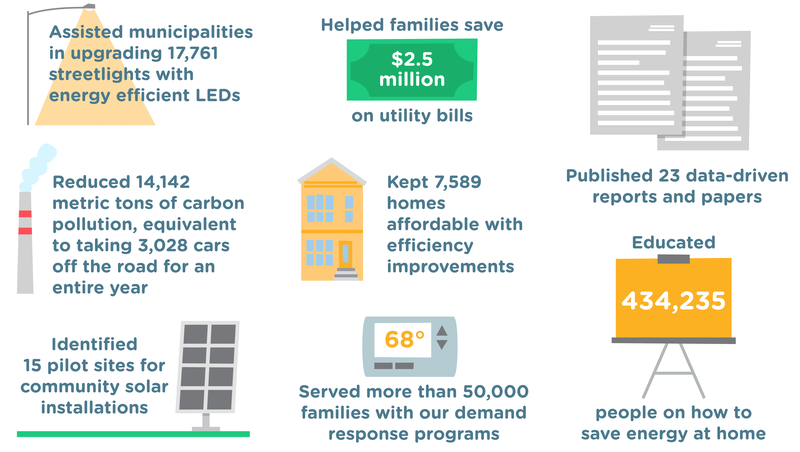 Together, they have saved more than 50,000 participants $27 million on their energy bills. We worked on a study of Michigan’s low-income residential and nonprofit sectors to quantify the savings potential in these building types. We found that these underserved markets can significantly contribute to reducing Michigan’s greenhouse gas emissions, save low-income households money, and strengthen local economies. Michigan low-income families on average spend 15% of their income on energy. Home energy efficiency upgrades, like air sealing, insulation, lighting upgrades, and others, can reduce energy burden by savings between 15% and 30% on energy costs. Elevate Energy installed ventilation systems in homes as part of a two-year study with the Illinois Institute of Technology. Poor indoor air quality can trigger asthma attacks and lead to repeated emergency room visits. Ventilation systems help circulate indoor air more efficiently, creating energy cost savings in addition to health benefits. We organized the Energy Education Challenge, where three central Illinois towns— Mason City, Petersburg, and Virden—competed to win money for their community through energy education. We helped residents learn to conserve energy and motivate their neighbors to do the same. A total of $50,000 was given out to communities and local organizations. During the course of the Challenge, almost 90 events were held and over 9,000 people were educated on ways to save energy. We’re teaching the real estate industry how to sell the sun. With support from the U.S. Department of Energy, we developed an online continuing education course for real estate agents, appraisers, and regulators to learn how to properly value residential solar photovoltaic systems in a real estate listing. Our nonprofit buildings program helps mission-oriented organizations dedicate more money to their services and less to utility bills. We facilitated efficiency upgrades for Chicago Commons, a social services organization serving Chicago families for more than 120 years. Simple lighting upgrades at a childcare center in Humboldt Park and an adult services center in Bronzeville are expected to save the organization roughly $8,631 on electricity annually.